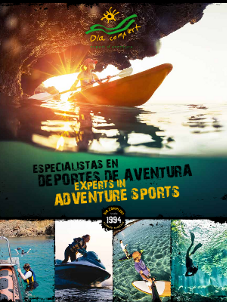 Dia Complert offers you an exclusive boat trip for people that look for a different excursion for enjoy the magnific water of Menorca, visiting cliffs, calas, virgin beaches and doing snorkeling sessions in amazing sets. You will visit incredible places that you'll never forget. 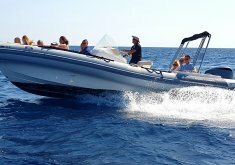 You are guaranteed an unique experience on board a 8 metres speed boat to accommodate 11 people and guided by a skipper from Menorca who knows until the last corner of the island. 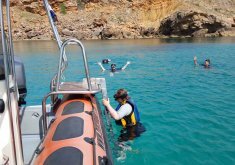 This is an activity that allows you enjoy pleasant dips and snorkeling sessions in the marine reserve of Menorca, the place with a huge marine species richness. 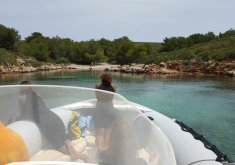 A boat trip thought for discover the authentic Menorca, that you can enjoy in groups of 11 people maximum or exclusively for you. Don't forget your water camera! Boat trip around virgin beaches of the north coast and the marine reserve.